…how the children from Narnia coped back in the real world? …what it’s like to voyage into a black hole? …how dystopias are created, and destroyed? …what you would sacrifice to protect your family? …what heroes talk about on the eve of a life-altering battle? …how to defend your village, when your heroes are away? …who protects your home when you’re not looking? Seven Wonders has the answers! 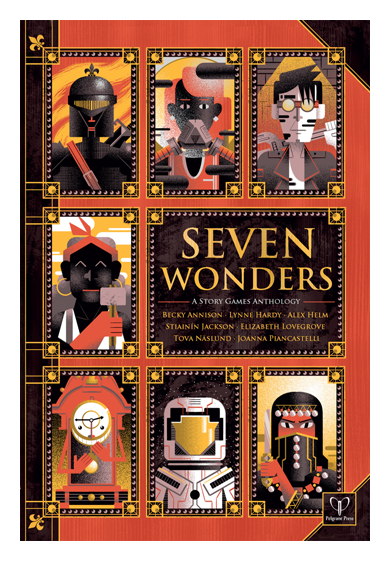 Seven Wonders is a collection of stand-alone story games from UK-based games designers, which focus on characterisation and inter-character drama, and use improvisational techniques to tell innovative, compelling tales. You can read more about the games here, and find Seven Wonders downloads and articles here.